I am feeling positively chipper in respect of the whole sorry 'What am I doing and how am I going to do it saga?' that has bedevilled my efforts over the last couple of months. Actually I should qualify that in that I am closer to decding what I want to do or rather closer to deciding what I am NOT going to do - which is nearly as important....:-) Confused? Well read on and all will become clearer. I have finally joined the Continental Wars Society run by Ralph Weaver. My only regret is that I had not done this sooner as the journal - The Foreign Correspondant - is a cracking read, albeit modest in its page count. The wars in Europe during the 19th century were many and varied and have sufficient variety to cater for even my own somewhat eclectic tastes. For me the various wars involving the Turks hold centre stage - I never really got into the Franco Prussian War - although at present I am reading and rereading Ralph Weaver's wonderful book on the Swiss Civil War in 1847 called Three Weeks in November. Now there is a campaign worth looking at - if only for the sheer originality of it! Now if only I could factor in the Turks somehow I am thinking that there are the makings of something quite extraordinary. I suppose I could best be described as a wargaming navel gazer. I spend an inordinate amount of time thinking about gaming stuff and how best to realise my ideas on the table top. My thought processes range far and wide across most of recorded history and touches down occasionally on whatever shiny period happens to take my fancy. It is funny really, that after all this time I should have learned a thing or two but no, my goldfish like attention span still kicks in with monotonous regularity. The tipping for all this over thinking usually occurs with a question I know the answer to but have to keep reminding myself of it all the same. It is what periods do I enjoy reading about and gaming. For me the difficulty has always been the sheer variety of material available for pretty much anything imaginable conflict wise. I am as susceptible as the next man to the 'ooh shiny' syndrome - the new ranges of figures or rules or - as is usually the case for me - when a new and impressive looking book comes out. Books are definitely a weakness of mine and a glossy new title is guaranteed to get me reaching for a figure catalogue and seeing what rules would best suit the period in question. I have gone through more rationalisations of my collection over the years than I care to recall but have usually failed to keep to the best of intentions. This time though I have wised up to the fact that my time and resources are finite and that I really need to concentrate on less in order to get more done. Simple really when you think about. The look of thing of course means using figures or models. In an ideal world I would field armies of exquisitely painted figures marching valiantly across and 8ft by 5ft table that would live in specially built glass cabinets when not being used - unlihely to happen unless a handy lottery win turns up! I have been pondering the whole figure size issue and am seriously thinking that in order to achieve the quantity I want (I do prefer units that look like units - perhaps a couple of dozen foot figures or a dozen mounted) in the time I have then the smaller scales would tend to be a better option. I had flirted with 10/12mm but am now looking at even smaller figures - 6mm. These of course have the advantage of being easy to paint - I have painted many of these back in the 1980s - and are cheap. Using my preferred 4 bases to an infantry unit (I am talking from a hexed Command and Colours perspective) I reckon that 6 or 8 figures per base (meaning 24 or 32 figures to a unit) would make a respectable looking formation thereby satisfying the massed visual aspect of my gaming. It is certainly something to think about - and I am doing just that. I have phases like this where my enthusiasm seems to go off the boil and I feel somewhat bereft of purpose but it always kicks back in at some point - I have reached this and am setting off on another round so to speak. Inevitably there are casualties in respect of what I will no longer be tackling and this time is certainly no different from any other occasion. I have a list of historical periods that are being 'nuked' - these were marginal interests in any case - and am making provision for the disposal of the appropriate material. Obviously the funds arising will be reinvested in those areas of more immediate interest so all is not lost. In the meantime though, I am reallykeen to get a game in. This weekend, being a bank holiday, will allow me the time to be able to tackle something using the block armies so my efforts over the next few days will be focused on teeing something suitable up which will feature as a battle report in due course. Almost as a follow up to my previous post it is fairly safe to say that I have recently been struggling to get my gaming mojo going. My get up and go seems to have got up and gone! Now I have taken the decision to abandon the Jutland project in its original format I feel curiously liberated and once again the ideas have begun to flow. Regular readers of the blog will no doubt be thinking something along the lines of 'here we go again' as I describe what I will be doing and more importantly, what I won't be. I am not going to bore you with the details but the upshot is there are a few things that will not be seeing the light of day and a few things that will. Those that have made the cut will not surprise anybody - the usual contenders of naval, 19th century and anything involving the late Ottoman Turks will all be featuring and whilst I have no concrete plans in place the ideas are well advanced - which is just as well as my time is very much at a premium due to work. The block armies will be coming out again and I am planning on extending this to cover my naval adventures as well - this will save a lot of time and will give me a huge amount of flexibility in terms of what I can tackle. I am not abandoning using models - far from it - but at least I will be able to get some games in. After a lot of thought and careful consideration of what is likely to be happening in my world over the course of the coming year I have taken the regretable decision to abandon my projected refight of Jutland to coincide with the centenary of the battle. I have not abandoned the idea entirely but for a variety of reasons 1/2400th will not be the scale of choice. I have really enjoyed the process so far - painting the models has been very therapeutic and I am really pleased with how the technique has worked out - but have hit an impasse in terms of availability of models and compatability wih the other naval ideas I have. The models, whilst very nice are simply too large for gaing space I have and so are unlikely to be used en masse. There is also the question of time that I can devote to the project and to do it properly - this simply is not there. It seems like an awful lot of work for a one off game and so for me is now no longer viable. It is a shame but I have to be practical. I will tackle something Jutland related next year in the same way as I will tackle something Waterloo related this year but I need to think about how in both cases. My feeling at this stage is that something board game or block related may be the answer - not quite the visual extravanganza one would hope for but being blessed with a vivid imagination certainly has its advantages when not using models! Now here's the thing. A long time ago (probably a couple of years at least) I picked up a paperback copy of The Washing of the Spears by Donald Morris at a boot sale for pennies. The book is in pretty good condition but I am sorry to say it went to the appropriate section of the bookshelf and was then forgotten about. I wanted something to read on the train and for some inexplicable reason this book caught my eye so I duly popped it in my bag and set off to work. Like many gamers I would rank Zulu as being amongst my top ten films for sheer entertainment value. For sure you can rip holes in the historical accuracy of the film but from a visual perspective and for sheer unadulterated excitement factor it is hard to beat. For many years I had promised myself I would research the period in more detail but apart from the off half-hearted attempt (even to the point of buying some figures) I never really followed this through. You may recall I even managed to fight a couple of Zulu War games using my block armies - and I really enjoyed the resultant mayhem! The book covers the rise of the Zulu empire under Shaka and the war of 1879 and it describes rather more of the period than I expected. The upshot for me is that there are a number of permutations from a gaming perspective. Consider this: Zulu versus Zulu, Zulu versus Boer, Zulu versus British and Boer versus British. Realistically, assuming you would not want to offend the purist, the Boers and Zulus could be used for anything from 1835 onwards, certainly up to the first Boer War. I realize that the Morris title is a little dated - especially with the work of Ian Knight and others in recent years - but as an initial foray into the period it certainly serves to set the scene for more detailed research. 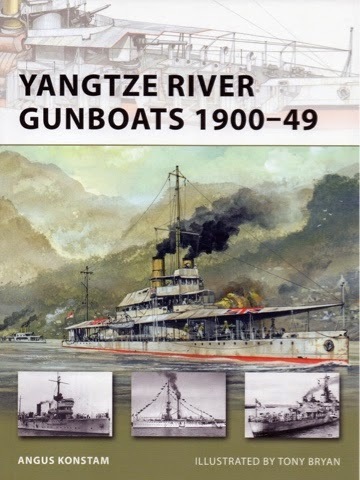 Following on from my previous post concerning Steamer Wars by David Manley I have been busy seeking some suitable inspiration for models and scenarios. Happily (and usually with a degree of inevitability) Osprey have come to the rescue with a couple of very useful titles indeed. This is a theatre of which I know very little other than seeing 55 Days in Peking and Yangtze Incident - the Sand Pebbles is one that I have not seen as yet - but I am aware that there is plenty of scope for actions of various sorts with warlords and foreign interventionists. The above title is possiby even better. 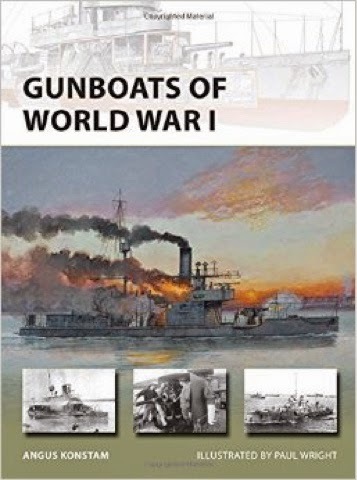 Gunboats had a very active war across the globe - from Africa to the Middle East and Eastern Europe - and these small ships have a major advantage in that they are relatively simple looking so modelling them, even at a basic level, should be pretty straightforward. Crucially, they can also be used as direct support for land operations without looking too out of place from a scale perspective.